This is an amazing book. 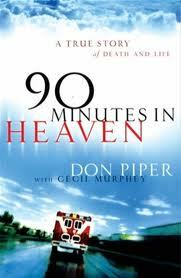 At first glance it looks like the story of a near death experience, but actually most of the book is Don Piper’s testimony of his struggles to recover from that time of being 90 minutes in heaven. He literally dies in a head on collision and is miraculously brought back to life by the prayers of another pastor on the scene of the accident. Piper’s descriptions of heaven are unusual – not your typical “light at the end of the tunnel”. It’s more focused on a reunion with the people that impacted his faith life. And also on the glorious worship music as he headed towards heaven’s gate. But at the heart of this book is his pain and depression at finding himself back on earth in extreme pain 24/7 for months. It is this journey in which he is brought back into the ministry and at peace with God that is powerful. The examples he gives of people that God brings him into contact with in order to minister are amazing and encouraging. Piper’s testimony reveals to me that sometimes God allows very painful experiences. But they have a purpose for those who love him (Rom 8:28). God opened Piper’s eyes to the people he could minister to because of his painful accident. On the other hand, it is very easy to give people false assurance through reading this or telling them about heaven. They believe that wonderful things are awaiting them when they have not yet surrendered their life to Christ. This testimony ought to be balanced with a warning to those who do not trust in Christ as the only way to the Father (John 14:6). They will not experience heaven. Reading and sharing this book can lead to conversations about death and the afterlife and give opportunity to talk about the “way to heaven” in detail. It’s an excellent evangelism starter.